Calculate how many degrees of phase shift the capacitor's voltage is, compared to the total voltage across the series RC network, assuming a frequency of 60 Hz, and a 50% potentiometer setting. 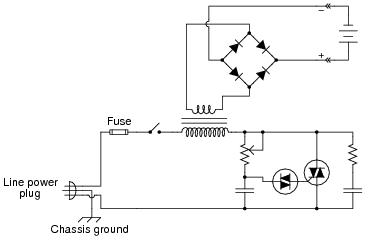 Explain how this circuit works. Why can't any of the other lamps turn on once any one of them has been energized? Also, explain how the circuit could be modified so as to provide a "reset" to turn all lamps off again. Once any one of the SCRs has been latched, the voltage available at the switches for triggering the other SCRs is substantially reduced. A normally-closed "reset" switch may be installed in series with the battery to reset all lamps back to the öff" state. Challenge question: how could this circuit be modified to serve as a "first place" detector for runners competing on three different tracks? Draw a schematic diagram showing suitable sensors (instead of pushbutton switches) for detecting the passage of the three runners. A good question to challenge students' understanding of this circuit is to ask them how to ëxpand" it to include four, five, or six lamps instead of just three. I found this circuit design in the October 2003 edition of Electronics World magazine. The original circuit, submitted to this periodical by M.J. Nicholas, appears on page 35 of the magazine in a slightly different form, with four lamp circuits instead of three, and using regular rectifying diodes instead of Schottky diodes as I have shown. Measuring the supply voltage with a voltmeter, everything checks out well. 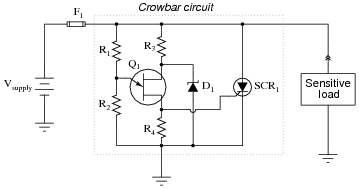 There does not appear to be an overvoltage condition causing a legitimate "crowbar" event in the circuit. Disconnecting the load from the crowbar circuit and powering it up with a standard bench-top laboratory power supply reveals the load to be in perfect condition. Thus, both the source and the load have been eliminated as possibilities that may have blown the fuse(s). 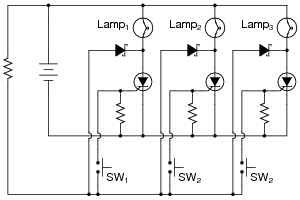 A benefit of this circuit that is easy to miss is the TRIAC's ability to provide zero crossing turn-off. Discuss why this might be important when controlling power to inductive loads. It should be noted that the label ßolid-state relay" is not exclusively reserved for opto-TRIAC devices. Many different types of solid-state relays exist, including opto-BJT, opto-FET, and opto-SCR. Be sure to mention this to your students. Too much triggering voltage is being applied to the TRIAC in this configuration. I'll let you determine how to re-wire the circuit to avoid this problem! I've seen students do this a few times, with startling results! The only problem with it is the lack of full control over the light bulb's brightness. At one extreme of the potentiometer's range, the light bulb is at full brightness. 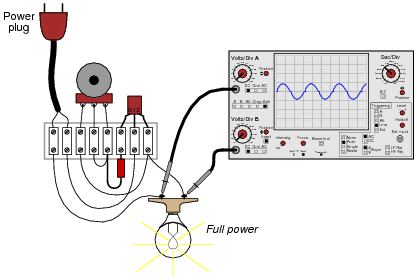 As the potentiometer is moved toward the direction of dimming, though, the light bulb approaches a medium level of intensity, then suddenly de-energizes completely. In other words, this circuit is incapable of providing fine control of power from öff" to "full" light. The range of control seems to be from full brightness to half-brightness, and nothing below that. The TRIAC's triggering is based on amplitude of the power source sine wave only. At minimum (adjustable) power, the TRIAC triggers exactly at the sine wave's peak, then latches on until the load current crosses zero. 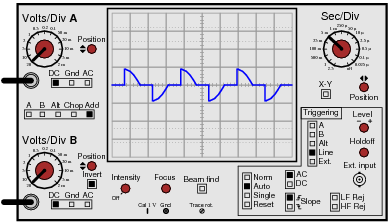 A shorter waveform duty cycle is simply not possible with this scheme because there is no way to trigger the TRIAC at a point past the sine wave peak. Follow-up question #2: explain how the oscilloscope is being used by the student, with two probes, channel B inverted, and the Ädd" function engaged. Why is this mode of usage important for this kind of voltage measurement? Commutation is an important issue in any kind of thyristor circuit, due to the "latching" nature of these devices. 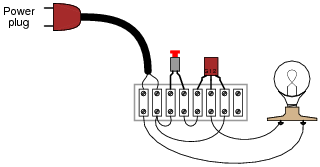 Explain what "commutation" means, and how it may be achieved for various thyristors. Commutation is nothing more than a fancy word for ßwitching" (think of the commutator in a DC electric motor - its purpose being to switch polarity of voltage applied to the armature windings). In the context of thyristors, "commutation" refers to the issue of how to turn the device(s) off after they have been triggered on. An important feature of all thyristors is that they latch in the ön" state once having been triggered. This point needs to be emphasized multiple times for some students to grasp it, as they are accustomed to thinking in terms of transistors which do not latch. Hint: the secret is in the capacitor, connected between the two SCRs' anode terminals. 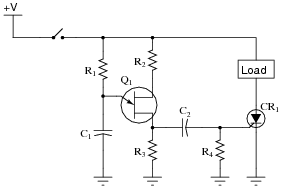 This method of switching load current between two thyristors is a common technique in power control circuits using SCRs as the switching devices. If students are confused about this circuit's operation, it will help them greatly to analyze the capacitor's voltage drop when SCR1 is conducting, versus when SCR2 is conducting.